Late Anti-Apartheid Leader Ahmed Kathrada: 'Don't Harbor Hatred And Revenge' : Parallels The anti-apartheid activist, who died Tuesday, worked to end apartheid alongside Nelson Mandela. In his later years, he lamented South Africa's divisions and criticized President Jacob Zuma. Ahmed Kathrada, an anti-apartheid activist and close friend of former South African President Nelson Mandela, died Tuesday in Johannesburg. Ahmed Kathrada, a former political prisoner, politician, anti-apartheid activist and lifelong friend to Nelson Mandela, died Tuesday at a Johannesburg hospital at age 87. In recent years, he had expressed concerns about his country's direction, and called last year for the resignation of President Jacob Zuma. An activist with the African National Congress, Kathrada — known for decades by his nickname Kathy, and later in life, as Uncle Kathy — was jailed for decades along with Mandela. He was a defendant in South Africa's two historic trials: the five-year Treason Trial, which started in 1956 and precipitated a turn in the African National Congress's reaction to apartheid, and the 1964 Rivonia Trial, in which anti-apartheid leaders were charged with plotting violent revolution. In the first trial, all 156 defendants — anti-apartheid figures including Kathrada and Mandela — were acquitted of treason. In 1960, while the trial was still going on, South Africa's apartheid government banned the ANC. A year later, the ANC formed its armed wing, uMkhonto weSizwe (Spear of the Nation), to lead a campaign of sabotage and bombings against the government. With the ANC banned, Kathrada and other leaders went underground. While in hiding, he helped organize a 1961 television interview with Nelson Mandela, explaining the ANC's shift from passive resistance to armed struggle. Kathrada was tasked with driving the interviewer, Brian Widlake, to the ANC's hideout. 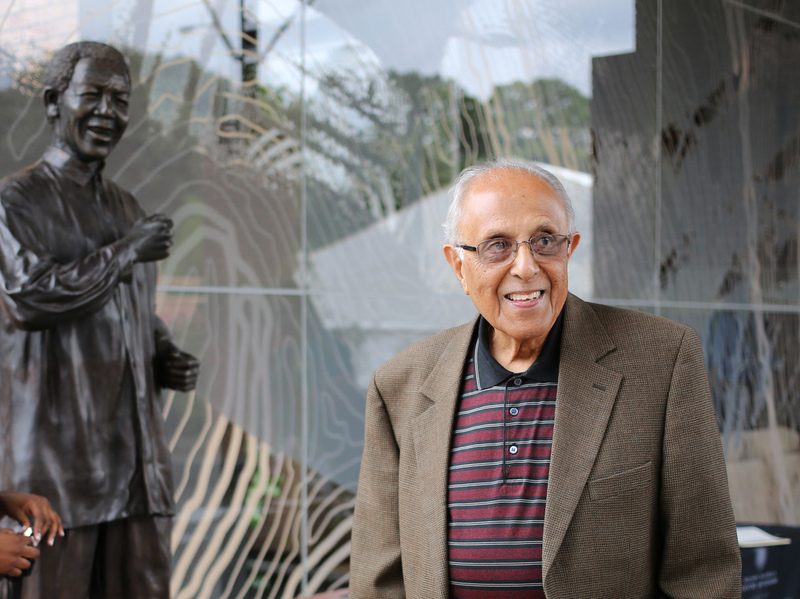 "Being me, with my expertise in direction, I lost my way," Kathrada joked in an interview with NPR earlier this year. "This way and that way and this way. Eventually, I reached him. And this man says, 'Mr. Mandela, before we start this interview, I want to compliment you on your security.' He doesn't know I'm lost." On July 11, 1963, apartheid police raided Liliesleaf Farm, where prominent anti-apartheid leaders had taken refuge. Police arrested Kathrada and others there, and discovered the ANC's military plans. The arrests led to the Rivonia Trial. All the defendants agreed at the outset to not contest the verdict or sentence, which could have been death by hanging. Kathrada was among those convicted of treason. 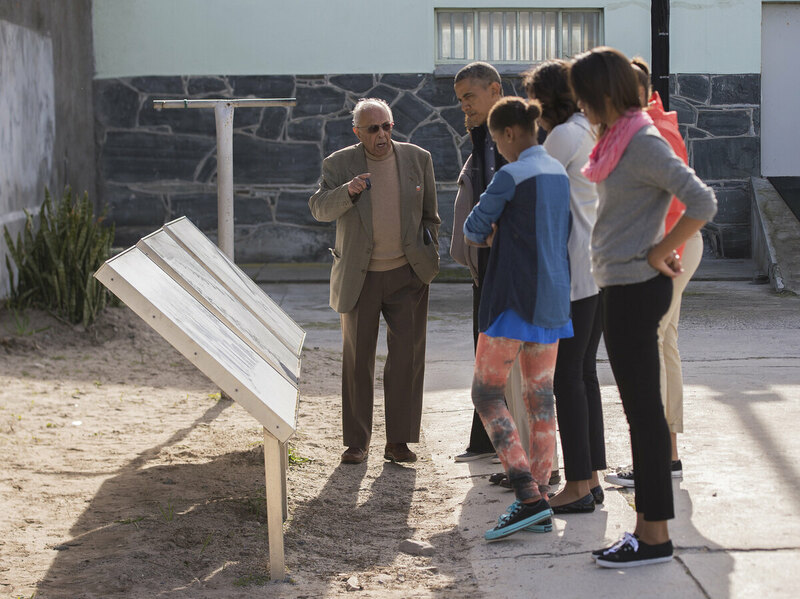 Kathrada (left), showed the Obama family around Robben Island on June 30, 2013. Kathrada chose to live on the island in his later years. "He [the judge] passed the sentence, then walked. I couldn't hear. And many of us couldn't hear what he said. [Anti-apartheid leader] Denis Goldberg heard; we asked him, and he said 'Life.' So there was a collective sigh of relief," Kathrada recalled. He entered the maximum security prison on Robben Island, off the coast of Cape Town, at age 34. He remained locked up for the next 26 years, until he was 60. In 1982, along with Mandela and other leaders, he was transferred to another jail, the maximum security Pollsmoor Prison in Cape Town. But the ANC leadership "insisted you did not waste your time in jail," Kathrada told NPR earlier this year. It was a lesson he took personally, earning four university degrees through correspondence — in history, criminology, African politics and library science, two of them honors degrees. The lesson, he believed, "applied particularly to the angry youth of post-'76 Soweto. Angry. Full of revenge. Hatred." The 1976 Soweto uprising was led by students in the Johannesburg township. Thousands protested the introduction of Afrikaans as the language of instruction in black schools. Police fired on protesters, killing and wounding an unknown number of schoolchildren. Kathrada wanted to ensure that those imprisoned afterward would be able to forgive when they were eventually released. "Anger, revenge, are negative emotions," he told NPR in January. "If one harbors those emotions, you suffer more. And that is where our very progressive policy of forgiveness [came from], in which the ANC started with the transformation from apartheid to democracy — forgive. Don't harbor hatred and revenge. "We live in a South Africa [where], unlike other colonial countries where the colonists went home after freedom, our oppressors were South Africans, born and bred in South Africa. And not a few thousand, but a few million. So we had to get our people to understand that these are not a few thousand that you can drown in the sea." Later in life, Kathrada often asked school groups what they imagined he missed most while he was in prison. Food and family, he said, were always the first two guesses. But they were wrong. "The exact thing is children. That's what you miss most," Kathrada said. "Sometimes you want to hear a child cry." He did not see a child for 20 years. He had none of his own. He refused conditional releases, and finally left prison for good in 1989. With the ANC un-banned, Kathrada joined the party again. After the elections of 1994 — the first truly democratic, all-race elections in South African history, in which Mandela was elected president — he served as Mandela's parliamentary advisor. "It was a one-way thing where I learned, but learned quickly enough, that this is not for me," Kathrada said of his single term in Parliament. When he and Mandela stepped down in 1999, he became chairman of the Robben Island Museum. He maintained a residence on the island and gave VIP tours of the prison, including one for President Obama and his family in 2013. He quipped there was "no crime or pollution" on the island, making it the best place to live in Cape Town. Later in life, he wrote memoirs and established the Ahmed Kathrada Foundation, which seeks to end racialism in South Africa. But 23 years after the dawn of democracy and the fall of apartheid, Kathrada, whose family was of Indian origin, lamented that South Africa remained so geographically divided and economically disparate. "Indians still live in Lenasia. Coloureds still live in Eldorado. Blacks still live in Soweto," he said of areas of Johannesburg, using the legal language for races in South Africa. In his final years, Kathrada remained relatively active with the ANC. He was a member of his neighborhood branch and attended national functions. But he was not a fan of South Africa's current leader, President Jacob Zuma, who South Africa's highest court says has flouted the constitution. Last year, Kathrada wrote a scathing critique in the form of an open letter to Zuma, demanding his resignation. He said he "had agonized" before writing it because he never wanted to criticize the ANC or its leaders. In the letter, Kathrada asked Zuma, "Don't you think your continued stay as president will only serve to deepen the crisis of confidence in the government of the country?" It is unclear if Zuma will attend Kathrada's funeral on Wednesday.